The MY Variety Voyager is a ship that exudes unrivalled comfort and elegance and promises only the best cruises. 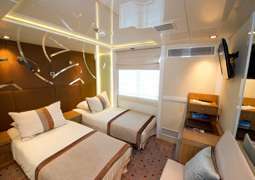 The cabins of the MY Variety Voyager offer pure relaxation without any compromise. The comfortable cabins make you feel as if you are royalty but also as familiar as if you are in your own home. The nice warm colours combined with the stylish furnishings add to the ambience. Dine in a stylish and welcoming environment aboard the MY Voyager Variety where there are panoramic windows all around the restaurant allowing you to enjoy the fantastic view of the sea and passing landscapes. The skilled kitchen staff will prepare the finest delicacies for you using local spices to create an explosion of flavours. There is a buffet where you can get tasty and fresh hot and cold dishes as well as some made in front of you. If you would prefer to dine al fresco then please make your way down to the open air restaurant. It is possible to have a vegetarian option or specialist diet if you make a request in advance. On board the MY Variety Voyager there is a variety of options to keep you entertained. There is the lounge on the main deck which is large enough to accommodate all passengers and is a perfect place to have hours of fun. The spacious lounge is a perfect place to hold presentations or speeches. If you would prefer to be out in the air with the wind blowing through your hair then you can relax on a sun lounger and read a book or enjoy a cool drink from the bar nearby. However you can also enjoy a good book at the ship’s library and spend some time in peace and quiet alone. Afterwards you can enjoy cocktails at the Horizons Bar & Lounge located on the upper deck or dance the night away. The destinations which the MY Variety Voyager visits span across areas where one can go kayaking and snorkelling, and allow you to experience the underwater worlds (as well as those on shore!) There is the chance to sail and optional excursions to get to know the locations even better. The ship also has a platform which gives you direct access to the sea. 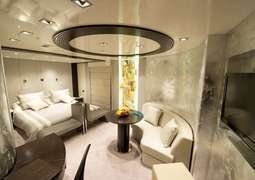 The spa and fitness centre aboard the MY Variety Voyager offers a range of treatments such as relaxing massages and various hair, face and nail treatments. If you are a sports enthusiast then make sure you try out the facilities on board for a good workout and then visit the sauna afterwards to release the tension from your muscles.